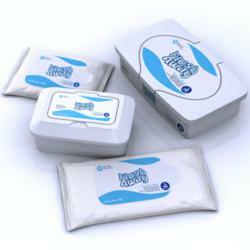 Disposable flushable wipes that are septic safe and patient friendly! "Dynarex FlushAway Disposable Flushable Wipes are Septic Safe and Patient Friendly!" Dynarex Corporation, a leading manufacturer of a broad range of medical products located in Orangeburg, NY, is pleased to introduce - FlushAway Flushable Disposable Wipes to the healthcare community. FlushAway Flushable Disposable Wipes are a breakthrough in a new pre-moistened wipes that are flushable and dispersible. They are made with a new patented technology which makes them highly biodegradable and easy on your septic systems. They are made of 98% cellulostic fibers that stay strong during use but quickly break down in the toilet and are septic safe – saving you unnecessary septic cleaning costs and worry! FlushAway Flushable Disposable Wipes are convenient to use, safe for use on patients’ skin, hypoallergenic, ph balanced and alcohol free. They are moisturized and smooth with the touch of aloe that meets the healthcare professional needs and most of all are patient friendly. FlushAway Flushable Disposable Wipes are available in a 9” X 12” Adult Tub and a Flow package, as well as a 5” X 8” Junior Tub and Flow package. In addition, Dynarex offers a wide range of Personal Cleansing Wipes from Baby Wipes, Personal Cleansing Washcloths (both wet and dry), and Patient Bath Packs as well as Perineum Wash products in multiple sizes. The Dynarex Corporation continues to expand its medical product lines for the healthcare industry. Dynarex offers a large portfolio of medical care product categories such as: antiseptic products, incontinent care, diagnostics, urological and respiratory products, personal protection, gloves, wound care, emergency first aid, patient care products and more! Dynarex is committed to the highest quality disposable medical products in the industry.